Agriculture Data and Citizens in the African Open Research Data Space. FOR MORE INFORMATION SEE THE FILE ATTACHED. 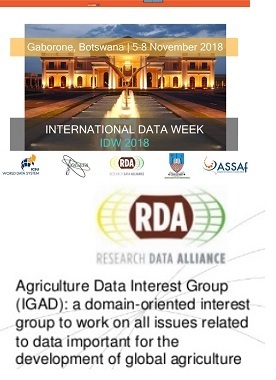 IDW is a great opportunity for connecting between data practitioners, information managers, researchers, and policymakers - with several active AGRICULTURE DATA Working Groups that will be hosting events during the week and many great links among people and organizations working in tech, data and information management in global AGRICULTURAL development. - as a part of International Data Week (IDW) coming November 5-8 2018 in Gaborone, Botswana. Please kindly consider submitting an ABSTRACT due JUNE 25, 2018. ... is a global conference taking place in Africa. It encompasses all issues relating to data in research from cutting edge issues in data science (the digital frontiers of global science), through challenges of data intensive research, research infrastructures, data stewardship, the use of data in science, society, innovation and development. As a session organiser, please, publicise your session; please take responsibility actively to make sure that any names speakers submit their abstracts and please do your best to solicit additional papers. You can point participants and prospective authors to your session description page which has the URL: https://www.scidatacon.org/IDW2018/sessions/NNN/ where NNN is the three number session ID. Please note that if a given session receives a greater number of quality papers than foreseen, there is the possibility of expanding that session over more than one slot. Conversely, if a session does not receive a sufficient number of quality papers then the session will not be retained in the programme and any accepted papers will be redistributed accordingly. 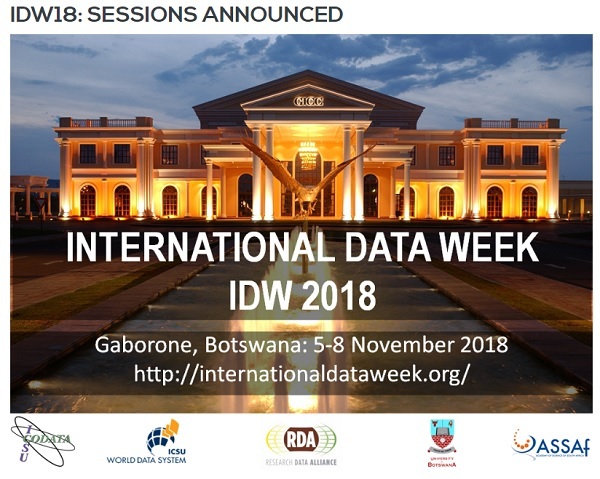 International Data Week is organised by CODATA, the Research Data Alliance (see the 12th Research Data Alliance (RDA) Plenary Meeting), the World Data System, the African Open Science Platform and the Botswana Open Data Open Science Forum, represented by the University of Botswana. RDA/IGAD (Agricultural Data Interest Group) chairs are organizing the IGAD Meeting(s) in Gaborone (Botswana) November 2018. If you are interested in attending the RDA Plenary and IGAD Meeting(s), please send this information to AIMS@fao.org with Subject "IGAD/RDA - Botswana 2018". To keep up-to-date with AIMS news, please, Sign up for AIMS news and follow @AIMS_Community on Twitter.